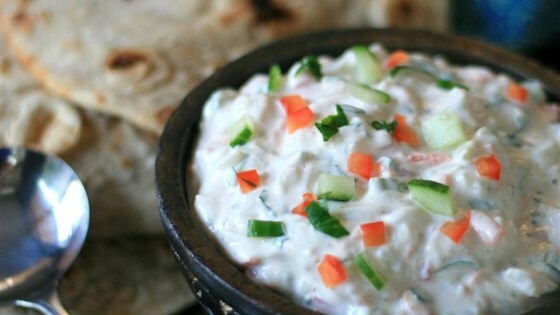 "I'm a huge fan of raita but I always find myself wanting more veggies in it. So over time I developed this recipe. It's high in protein and tastes great. I've largely given up on dipping anything in it. I just eat it by the spoonful. The recipe takes a while, but it makes enough to merit it." Spoon yogurt into a cheesecloth-lined colander; set aside until most of water has drained, at least 30 minutes. Place grated cucumber and grated carrot in a cheesecloth-lined colander; sprinkle with salt. Place a heavy object, such as a bowl, atop cucumber and carrot to drain excess water, 15 to 20 minutes. Mix yogurt, cucumber, carrot, onion, red bell pepper, celery, parsley, lemon juice, mint, and cumin in a bowl; season with salt and black pepper. Refrigerate for flavors to blend, at least 1 hour.